Gas Authority of India Ltd (GAIL), is primarily engaged in transportation and wholesale distribution of natural gas. The company has also diversified into other integrated energy and petrochemical activities. Petrochemicals is a major area of GAIL's business activity. GAIL has set up a world-scale Gas Cracker plant at Pata in Uttar Pradesh in Northern India at an investment of Rs. 25 billion having a design capacity to produce 300,000 TPA of ethylene (Expandable to 500,000 TPA). The Plant was commissioned in March 1999. Downstream units include an HDPE production unit of 100,000 TPA capacity and an LLDPE/ HDPE Swing plant of 160,000 TPA capacity. The Gas Authority of India plans to boost the capacity of its polyethylene complex in Auraiya by about 50,000 mt/yr by March 2003, a company source said Wednesday. THE board of Gas Authority of India Ltd (GAIL) today approved a proposal to take a 10 per cent equity stake in Haldia Petrochemicals Ltd. The approval is contingent on the financial restructuring taking place. The investment will be of the order of around Rs 200 crore. GAIL's entry into HPL follows the breakdown of talks with Indian Oil Corporation, which was set to acquire a 26 per cent stake in the company. The board of directors of the Gas Authority of India Ltd (GAIL) has approved a strategic marketing alliance with Haldia Petrochemicals Ltd (HPL), under which the 2 companies will enter into 4 commercial agreements for selling their petrochemical products. GAIL and HPL will enter into 3 separate long-term offtake agreements for polypropylene, propylene and pentane. State-owned gas firm GAIL India (GAIL) Ltd said it has entered into a strategic alliance with Kolkata-based Haldia Petrochemical Ltd for marketing of petrochemical products. Gail (India) Ltd is to increase its ethylene manufacturing capacity at the Pata plant in Uttar Pradesh to 450,000 mt/yr from the current 310,000 mt/yr by December, investing around Rupee 7-bil, Gail chairman and managing director Proshanto Banerjee said on the sidelines of an industry conference Monday. The state-run petrochemical company is augmenting its ethylene capacity by increasing the number of cracker furnaces from four to five, and is also setting up an additional LLDPE/HDPE (Swing Plant) of 100,000 my/yr at the same petrochemical complex to utilize the additional ethylene production. With the recent approval of the Cabinet Committee on Economic Affairs (CCEA), GAIL (India) Limited led Joint Venture Company (JVC) will implement the Rs. 5460.61 crore Assam Gas Cracker Project. The project to set-up an integrated Petrochemical Complex at Lepetkata, District Dibrugarh shall be implemented by a Joint Venture Company (JVC) to be promoted by GAIL with 70% equity participation. The remaining 30% equity will be shared equally among OIL（Oil India Ltd）, NRL（Numaligarh Refinery Ltd ） and Govt. of Assam. The project will be completed in 60 months from the date of approval. The petrochemical complex will comprise of a cracker unit, downstream polymer and integrated off-site/utilities plants. The complex has been configured with a capacity of 220,000 tons per annum (TPA) of Ethylene and 60,000 tons per annum of propylene with Natural Gas and Naphtha as feed stock. The site has been identified by the Govt. of Assam and necessary Environmental clearance has been obtained. The existing LPG plant of GAIL at Lakwa will be modified to process gas for recovery of ethane and higher hydrocarbon fraction which will be transported to Lepetkata through a pipeline. The Products from the Petrochemical Complex shall be 220,000 Tons per annum (TPA) of HDPE/LLDPE, 60000 TPA of Polypropylene, 55000 TPA of Raw Pyrolysis Gasoline and 12,500 TPA of Fuel oil. 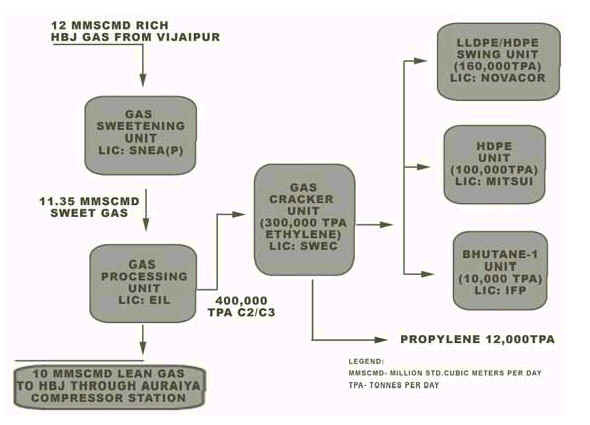 The Assam Gas Cracker Project has been approved by Cabinet Committee on Economic Affairs in its meeting held on 18th April, 2006 under an equity arrangement of GAIL (70%), OIL (10%), NRL (10%) and Govt. 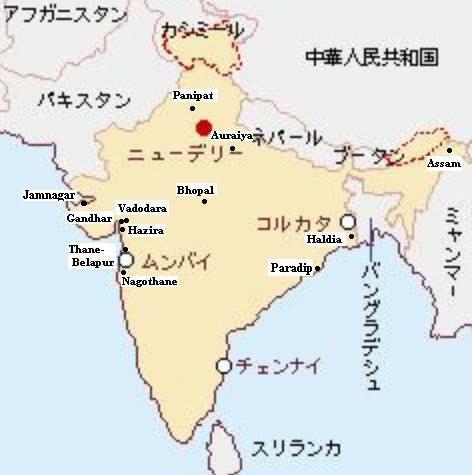 of Assam (10%) with a project cost of Rs. 5460.61 crores in which capital subsidy is Rs.2138 Crores. A Joint Venture agreement has been signed on 18.10.2006 and the company 'Brahmaputra Cracker and Polymer Limited' was registered on 08.01.2007. At a time when political and business relations between India and Iran are under pressure, government-owned GAIL India, the country's largest transporter and marketer of gas, plans to set up a mega $2.3 billion petrochemical plant in Iran. The Rs 16,047-crore company has appointed public sector consultancy, Engineers India Ltd, to conduct feasibility studies for the plant with a capacity of 3 million tonnes a year that is likely to be set up near the gigantic South Pars gas field in Iran. The largest petrochemical plant to be set up by GAIL, the project would have Reliance Industries Ltd (RIL) and an Iranian government-owned company as partners, a senior GAIL official said. GAIL (India) Limited and Indian Oil Corporation Limited (IOCL) today signed a Memorandum of Understanding (MoU) for cooperation in the area of Petrochemicals to collaborate for exploring the possibility of setting up of cracker complex including downstream derivatives at Barauni. GAIL shall assess the prospect of natural gas availability from the KG basin field including the potentiality of the rich gas to be used as part of the feedstock for the Project and work out the modality for distribution of the same from KG basin field to the Project site. GAIL will subsequently develop appropriate definitive agreement for supply of the gas to the joint venture, once formed. The proposed chemical plant will use 250,000 tonne of naphtha produced by IOC's Barauni refinery and the natural gas that GAIL plans to bring from eastern offshore and imported LNG through the planned Jagdishpur-Haldia pipeline. Project structure and equity participation has not yet been decided. "It could be a 50:50 joint venture between Gail and IOC... it may also be a public-private partnership," Choubey said indicating that the alliance had room to induct a strategic partner. A 130-km spur line from Gaya to Barauni would be laid to transport gas to Barauni fertiliser plant, IOC's refinery and the proposed petrochemical unit. Gail's Jagdishpur-Haldia pipeline would transport gas found in eastern offshore.